-3D Adaptive Sipes increase block rigidity for longer, more even wear, while promoting wet and winter traction. -Cross Grooves and Deep Circumferential Grooves expedite water evacuation and provide exceptional bite for improved winter traction. -Interlocking Tapered Center Rib provides constant rubber-to-road contact to enhance straight-line tracking. 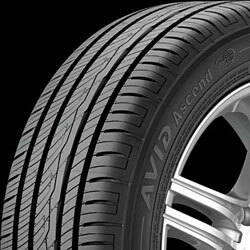 -Multi-Pitch Tread Design separates tread blocks into different sizes and shapes for a quieter ride.